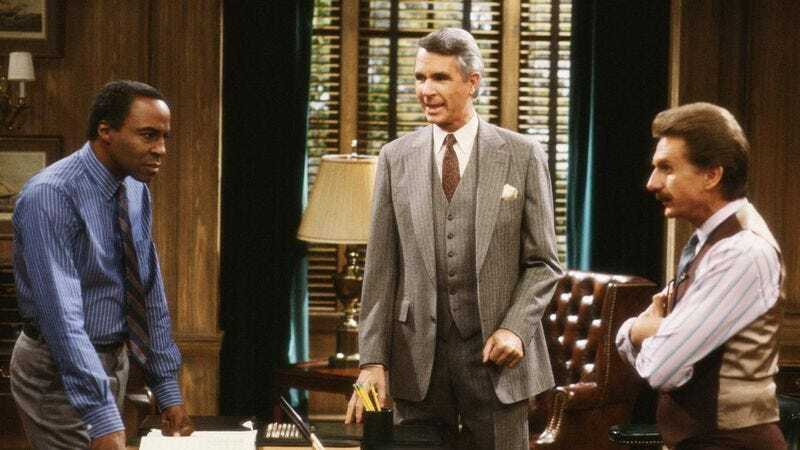 James Noble, the actor best known for portraying perpetually befuddled Governor Gatling on the ABC sitcom Benson, died yesterday. Noble’s death was confirmed to the New York Times by a family spokeperson, who revealed that the actor died at Norwalk Hospital in Norwalk, Connecticut, having been in the hospital’s care since suffering a stroke the previous week. He was 94. Born and raised in Dallas, Texas, Noble got his start in acting by following in the footsteps of his older brother, Ralph. “Ralph was my god,” Noble said in 2013. “I wanted to be everything he was. To read all the books he read. When he was on stage, he was self-conscious, but when I began to act, I was relaxed and thought, ‘This is great. I feel right at home.’” Although Ralph died on D-Day, living up to his last name by giving away his life jacket in order to save a fellow seaman, he had already helped forge his brother’s future by taking him to New York, a trip which caused Noble to fall in love with the city and, in short order, led him to relocate there to pursue his career. In addition to studying under Lee Strasberg at the Actors Studio, Noble worked regularly in the theater while also making the rounds on various TV series filming in New York City, including primetime dramas like Studio One, East Side/West Side, and The Defenders as well as such soap operas as The Doctors, As the World Turns, Another World, and The Edge of Night. It was his work in the theater, however, that led to his increased profile in front of the camera: after working in 1776 on Broadway, Noble was cast in the 1972 motion picture adaptation of the musical. As the’70s progressed, so did Noble’s on-camera career, in 10, Promises in the Dark, and Being There, and in the waning months of the decade, he found his way into Benson, which turned into the longest-running and most high-profile role of his career. Noble served as Governor Gatling for seven seasons, with a great deal of that time being spent delivering dialogue to co-star Robert Guillaume which began with the words, “Benson, did I ever tell you…” By the time the series wrapped in 1986, Noble had 159 episodes of the series under his belt. While Benson was on the air, Noble appeared in Airplane II: The Sequel, and with his schedule open once again, he returned to the big screen, securing roles in A Tiger’s Tale, Paramedics, and Chances Are. In addition, Noble popped up in one-off guest star spots on Murder, She Wrote, Father Dowling Mysteries, Perfect Strangers, and Law and Order, while comic book adaptation aficionados may recall that he played Mr. Lodge in the TV movie Archie: To Riverdale and Back Again. Beyond his work as an actor, Noble also worked behind the scenes, co-founding Open the Gate Pictures and producing and starring in the award-winning short film Glacier Bay, but Noble never stopped acting. He continued to pop up in short films on a regular basis, including a recurring collaboration with filmmaker Fred Stroppel which led to a hilarious 2014 short that found Noble portraying infamous rancher Cliven Bundy.